The new vehicle fuel economy label announced today by EPA and DOT beats the current label, providing better information on fuel costs and adding emissions of both greenhouse gases and traditional air pollutants. The new label takes on the confusing matter of the divergence of fuel economy and greenhouse gas performance when fuels other than gasoline enter the mix, showing for example how a diesel vehicle does better on miles-per-gallon than on CO2 emissions, while the reverse is true of natural gas vehicles. The label falls short on other counts, however. The “Fuel Economy & Greenhouse Gas Rating” is unaccountably weaker than EPA’s existing rating scheme, giving a 38 mile-per-gallon vehicle a perfect 10, for example. The label also fails to clarify the performance of plug-in vehicles. It contains a lot of useful information about these vehicles, but doesn’t answer a basic question that will be on the minds of nearly everyone interested in green vehicles: how do a plug-in’s energy use and environmental impacts compare to those of, say, a good hybrid that doesn’t plug in? An important measure of those impacts is “full fuel cycle” emissions, i.e., the emissions generated in the production and distribution of the fuel—whether gasoline or electricity—along with the emissions from the tailpipe. The label ratings punt on this tricky but crucial question by assigning zero emissions to electric operation, even though half of the power generated in the U.S. is still from high-emissions, coal-fired power plants. 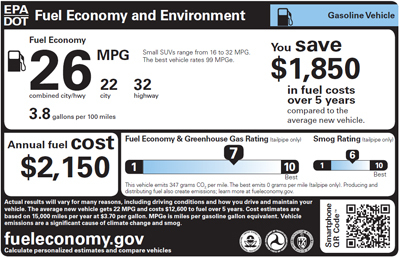 The label does point the consumer to the Web, where a calculator provides a plug-in vehicle’s greenhouse gas emissions by the user’s zip code. Labels are important to consumer understanding of vehicles’ energy efficiency and environmental performance. But the biggest step the Administration can take toward highly efficient, low-emissions vehicles is to ensure they’re available—in configurations that people want—by strengthening fuel economy and emissions standards. DOT and EPA are considering standards of up to 62 miles per gallon by 2025, a boost that would go a long way in reducing U.S. oil dependence and consumers’ pain at the pump. ACEEE has been rating vehicles since 1998 in ACEEE’s Green Book® (greenercars.org), using a full-vehicle-cycle, full-fuel-cycle approach. This year the two plug-ins on the market made it to the Greenest list, though neither took the number one spot.